God has given us everything we need to bring Christ to our world. This book examines not only why we haven’t but how we can. Satan successfully jams the gears of the church by disguising failure as success. Why can’t we see through this ruse? 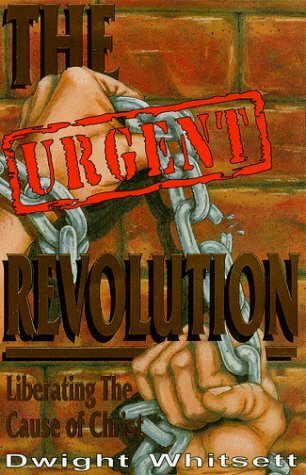 A “writ of habeas corpus” for the body of Christ, The Urgent Revolution rallies us to liberate the cause of Christ. It is a cause held captive by obsolete methods, irrelevant traditions and leaders without vision. It calls us to recapture our original purpose and destiny. It summons us to get off our pews, out of our buildings, and find our way back into the world we were sent to save. Reader Reviews:This book is a must read for those who are looking for a motivational reminder of our mission as a church. Whitsett gets to the point, with practical wisdom and insight. If you’re looking for novel marketing techniques this isn’t the book, but it you’re wanting to know where our priorities need to be as the body of Christ, then you’ve come to the right place. Dwight Whitsett doesn’t use a magnifying glass to pick out the apathy and inertia present in the church today, but he does lay it on the line to any thinking Christian who is not afraid of an honest look at our situation. In An Urgent Revolution, Dwight gives a wake-up call to everyone who is truly concerned about the unsaved state of most of the human race now living on our planet. His observations and remedies for change are presented in such a readable and humorous way that it should offend no one, with the possible exception of “God’s frozen people who will always give a cold reception to suggestions of change”. His call for “Radical Christians” to bring about a “radical change that reaches down to the very roots” (dictionary definition) to rid the church of “superficial, cosmetic worship” is based on the comments of people like Moshe Rosen, Executive Director of “Jews for Jesus”, who says “The problem in the American church is a great deal of inreach and not much outreach”……”people who have retreated into sanctuaries to be entertained.” Dwight points out with undeniable clarity the poor state of health in which the church finds itself today–a “Worship Society” in stark contrast to the early community of Christians whose practice of service was so different from the “services” we participate in today. This book clearly portrays the necessity of becoming the church that we should be, without getting sidetracked on non-essential matters. It powerfully sets forth a path for the church of God to take. I recommend this book immensely. Whitsett is right on target. The message of this book is so strong and pertinent and truly urgent. Hopefully, some of us are listening. There are so many good things to commend in the book. You certainly expressed a clear call for refocusing on our prime mission: reconciling men and women to God. You are exactly right in stating that we have (in general) lost sight of our divine mandate. I hope your book serves to awaken us to the ultimate purpose for the church’s existence. The Sunset Extension School Online Catalog.